Hello from Lima! I’m in Lima now doing some work with the St. James Society. I’ll post another update at another time summarizing my activities here. It’s not technically under Barriers To Bridges, but it’s worthwhile to share with you what’s been happening here. For now, I’ll share the latest happenings, including visa and a cost summary from the fundraiser. I was able to complete the final steps to get a 2-year religious volunteer visa in Ecuador. As I mentioned in my previous post, I was already far enough along the process that it made sense to complete it regardless of future plans for coming to the diocese of Ibarra in Ecuador. The last steps went off without a problem. I had to visit Quito and arrive at an earlier time than I could reach from Chontal. So, I decided to stay in Mindo instead of returning to Chontal on my way from visiting the Sisters in Puerto Quito. I arrived then in Quito at about 9:30am, and dropped off the last documents and my passport to Monica, the woman who services visas at the church headquarters. I then had to go with her assistant to another part of Quito, and that meant a 15-minute walk, a 35 minutes trains ride, then a taxi ride for another 15 minutes or so. I waited for another half hour or so, then got my picture taken, and that was it. I got lunch, and then took the metrobus back closer to where the headquarters is located, because the next day I was to stop by to pick up my passport with the completed visa. I had stayed before in a hostel not too far away, and I walked over to it. I found that it was out of business. 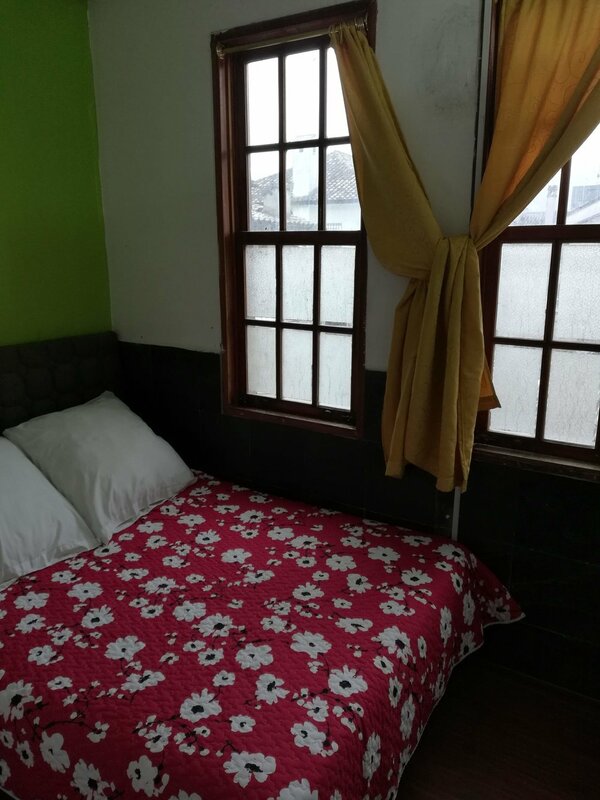 I then found a different hostel for $16 a night, and booked 2 nights, because it wasn’t a given that the visa would actually be processed and that I wouldn’t need to stay another night. 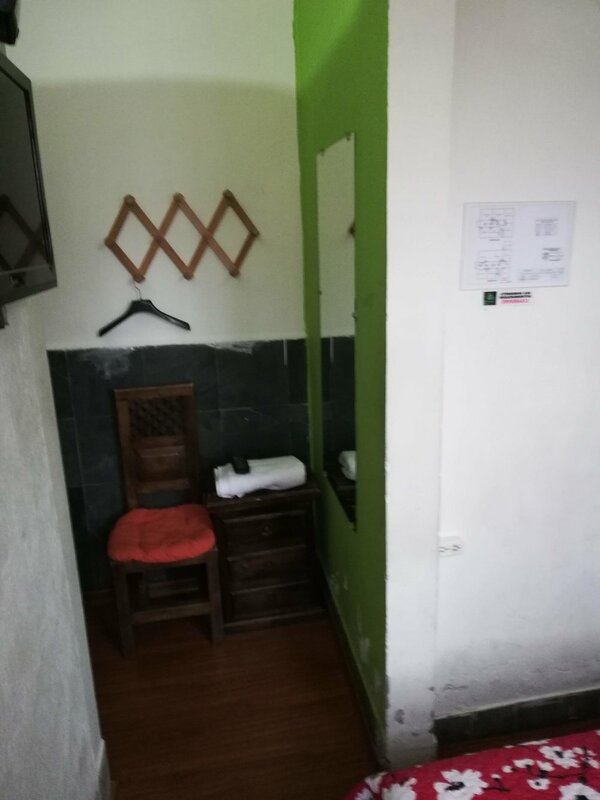 The room was barely large enough to fit the bed, but it included a private bathroom (photos below). I called my friend Rosa who owns a language school nearby, and spent the evening with her and her family and some of the students. It was a good evening! For the next morning, Rosa offered to give me a few hours of Spanish tutoring through one of the teachers in the school. So, I spent a few hours in the morning updating some of my Spanish. In the afternoon, I visited downtown Quito. It has been a while since being there, and I also wanted to see a certain chapel related to a legend about an indigenous woman who outsmarted the devil - and the colonialists! In any case, the chapel was under repairs, but it was good to see the historic center of Quito again. 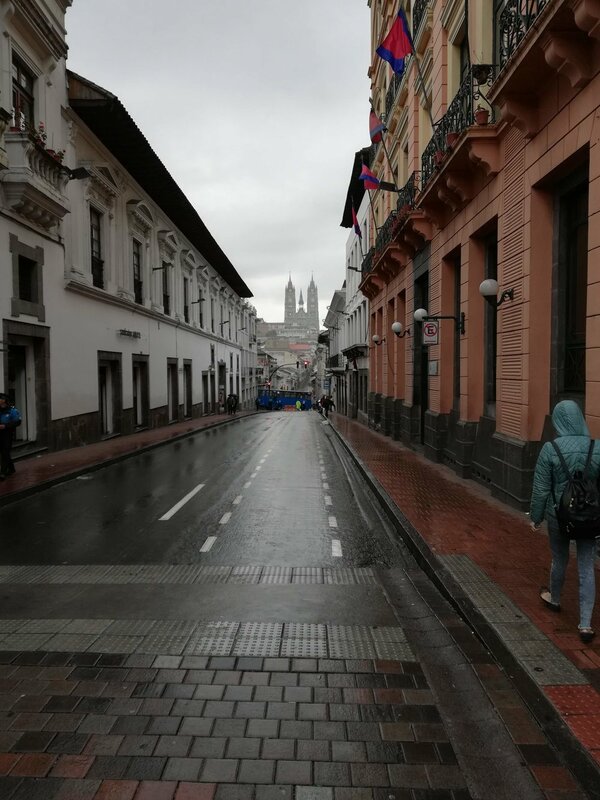 I caught this particular view of the Basilica through the streets of colonial Quito on my way back to the metrobus station. Later in the afternoon that day, I stopped by the headquarters and Monica had the passport ready, with the visa included. Click here to see it in all its glory. Having another day in Quito, I met up with a friend that I met a few years ago. She is working for the Center for Working Boys in Quito, as the director of the pastoral dimension. We before talked about my making a visit to the Center, and we had a good conversation. When I return to Quito from Lima, the plan is for me to visit the Center for a day. There may be an opportunity to volunteer there in collaboration with her, as there seems to be a similarity in spirituality and approach. So, we’ll see after I get back from Lima. After that, I returned to Chontal for a few days, and then I left for Lima. More on Lima in another update! The expenses related to the fundraiser are just about complete. My flight cost increased by $100 and probably will increase by a bit more, as my flight has to change. I bought the roundtrip ticket for about 6 months, but the airlines wouldn’t let me travel that way leaving Boston, because I didn’t have a visa longer than 90 days! So, they made me change the return flight to a date within that time frame. It’s essentially a placeholder date - I’ll have to change it again. I did manage to convince them not to charge me for two changes, just one! Some other notes: The change from $150 to 250 on the outreach reflects the cost of the pig in the Christmas celebration… My renewal of vaccinations came up unexpectedly just before traveling, as it slipped off my radar over the past few years. It left me needing to go to a travel clinic in the last week or so before leaving, and so it was a bit expensive: $312. But I got the bare minimums necessary (as recommended) for traveling to Ecuador… I was never charged the actual cost of the visa, which wasn’t clear to begin with, but was conservatively budgeted at $250. I also saved on the criminal record, and paid for only 3 months of health insurance. On the other side, I had to get an affadavit for $24, and then travel and lodging added up as I traveled to Ibarra and Quito. All in all, the amount raised pretty much matched the amount I spent. Thank you again for your contributions to the effort. i hope you feel you’ve been a part of what I’ve been doing, as you are. A lot of good has been done for a lot of people in a very special way - Christ has been proclaimed! Again, I’ll post another update when I can. Feel free to drop a note or comment, and have a great week.